Big Turnout At The Munster Senior & Novice Roads 2012 — St. Finbarr's A.C. The BARRS turned out in force for the recent Munster Senior & Novice Roads Championships, which took place on the back roads around Ballyanly on Sunday, March 9th last. A total of 37 club members turned up at the Inniscarra GAA grounds to collect their race numbers. 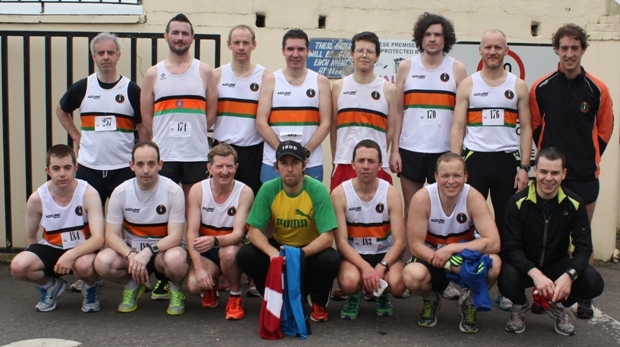 This was the biggest club turnout for an AAI event since the County Novice & Masters Cross Country at Conna in 2011. And when you consider that Conna was a combined Masters event, the figure is truely remarkable! The mass effort by the club was fully rewarded when the Novice Ladies A & B teams came home in first and second place, while the Novice Men were runner’s up. A big well done to all those who participated and a big thanks to Inniscarra GAA and the race organisers for the excellent, and well received, post race refreshments.